This post may contain affiliate links. See my disclosure for more information. 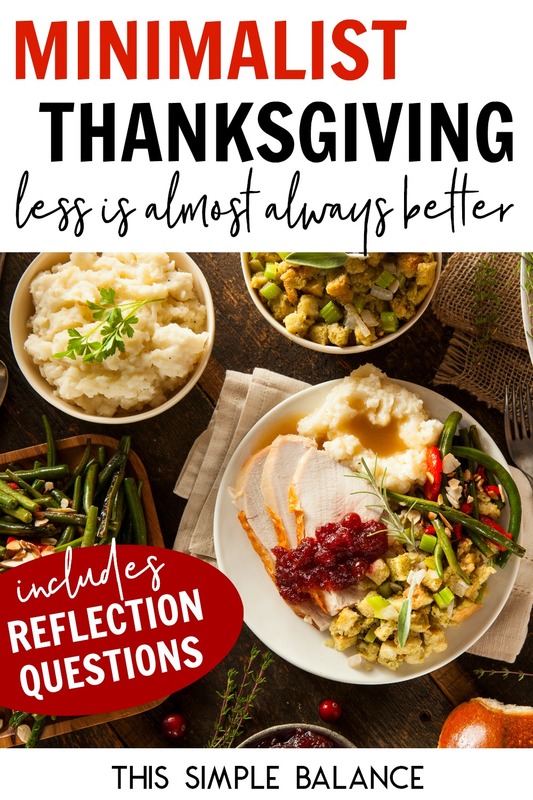 Inside: Afraid to do less this Thanksgiving? I thought a minimalist Thanksgiving would take away from one of my favorite days of the year. On the contrary, simple is almost always better. Our minimalist Thanksgiving was a small affair this year (2017). We didn’t travel to see family, all of which live more than a five-hour drive away. Four small children and only a few days off for my husband makes travel exhausting. Travel aside, we’re homebodies through and through. We just enjoyed a slow, simple Thanksgiving in our own home. When we learned that our friends (and neighbors) were spending Thanksgiving redoing their living room floors (their kids spent the weekend at their grandparents to allow their parents the time and space to complete the project), we invited them to join us for Thanksgiving dinner. We had plenty, and we invited them with no expectations that they would contribute to the meal. It was just fun to host friends for Thanksgiving. Now I’m no hostess. I’m pretty sure hospitality is my anti-gifting. I don’t really enjoy putting up elaborate decorations or making beautiful place settings. Thankfully, my daughter seems to have a knack for such things to eventually make up for my lack in this area. Hosting in the past has stressed me out to no end – so much so that hosting didn’t seem worth the stress. But our minimalist Thanksgiving completely changed my perspective on hosting any holiday meal. 1) Decluttering totally changes preparation for guests. While my husband claims our home is not a minimalist one (he’s seen pictures of nearly empty rooms with white walls and that’s not our house), I know better. We spent less than thirty minutes putting things away and tidying. Rooms needed to be vacuumed, but that was about it. The two minutes I spend every day cleaning the bathroom meant that it didn’t need a deep cleaning to make it guest-worthy – just the same two minutes I usually spend daily. We don’t have a lot of toys in our living spaces, so we didn’t need to spend all day putting them away. I also have simple system for storing items that need to be put back in upstairs rooms. Everything we find in the living room and kitchen that doesn’t belong can be easily tossed into the appropriate bin to put away in rooms on Monday (our weekly reset/cleaning day). I didn’t feel stressed about cleaning, and that’s a first. 2) Even a small menu takes juggling and coordination to prepare on time. Our menu was quite simple. Only four dishes needed to be made for Thanksgiving day. I made the desserts the day before Thanksgiving. Even so, it still came down to the wire. Our friends arrived: the turkey wasn’t carved and the mashed potatoes were not mashed. My husband took care of the kids (i.e. stopped them from eating everything that was already on the table before everyone sat down). Our friends ended up carving the turkey, while I finished making mashing the potatoes. And you know what? It wasn’t a big deal. The food made its way to the table. We ate. No one starved. Still, I can’t imagine adding anything else to our menu – at least not that I plan on cooking myself. Simple is almost always better. 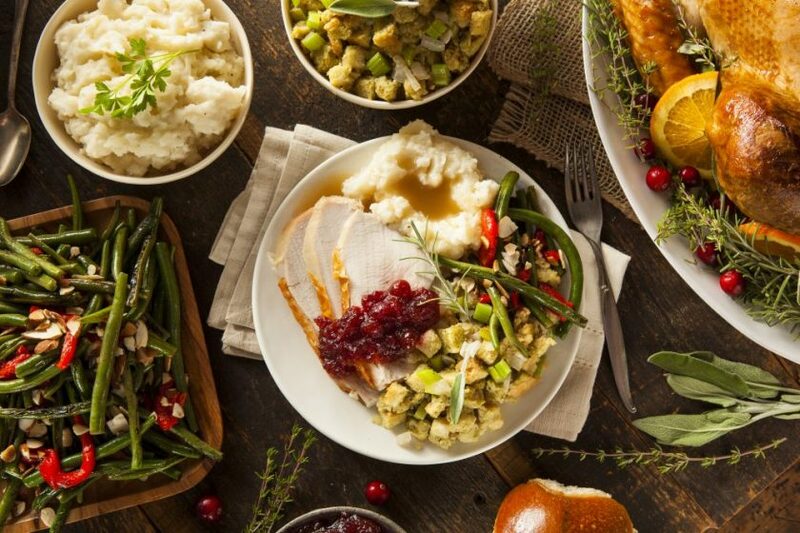 3) Thanksgiving essentials are different for everyone – and it’s o.k. that they’re different. I spoke with my mom on Wednesday. As I shared what was on our simple, minimalist Thanksgiving menu, she asked, “What? No corn bread pudding?! No squash? !” With her incredulous response, a few other things came to my mind that are usually on Thanksgiving menus – sweet potato casserole, homemade rolls. I experienced a brief moment of regret that we didn’t have the gigantic spread that is so many Thanksgivings in America. And then I remembered that none of these dishes are my favorite (the rest of my family wouldn’t even touch them). They would likely go to waste sitting in the fridge for a week, and two of our guests were from Ukraine where they don’t even celebrate Thanksgiving! I also heard the raised eyebrows in her voice when I mentioned the chocolate mousse cheesecake, an unusual Thanksgiving dessert to be sure. But I figured, when am I ever going to make a cheesecake if not for a holiday? So I went for it, and it was a hit. A new tradition has begun. When we lived in Boston, we spent Thanksgiving with the same friends a few years in a row. They had their own “it’s not Thanksgiving without this” type of dishes. Everyone has their own Thanksgiving essentials, without which Thanksgiving just wouldn’t be Thanksgiving. While I do miss being with extended family for Thanksgiving, there is something freeing about stepping away from your family of origin’s traditions. You can sift through what really matters for you, for your spouse, for your kids. It’s so much easier to simplify and keep only what truly matters to your little family. Plus, starting new traditions can be fun! Take some time to reflect on your own Thanksgiving. 1) Was your Thanksgiving stressful? Was the outcome worth the stress? 2) What did you love? What would you not have missed if you had forgotten to make it/decorate it? 3) What are your “Thanksgiving essentials” – for you and for your immediate family? 4) How can you simplify next year to enjoy the holiday even more? 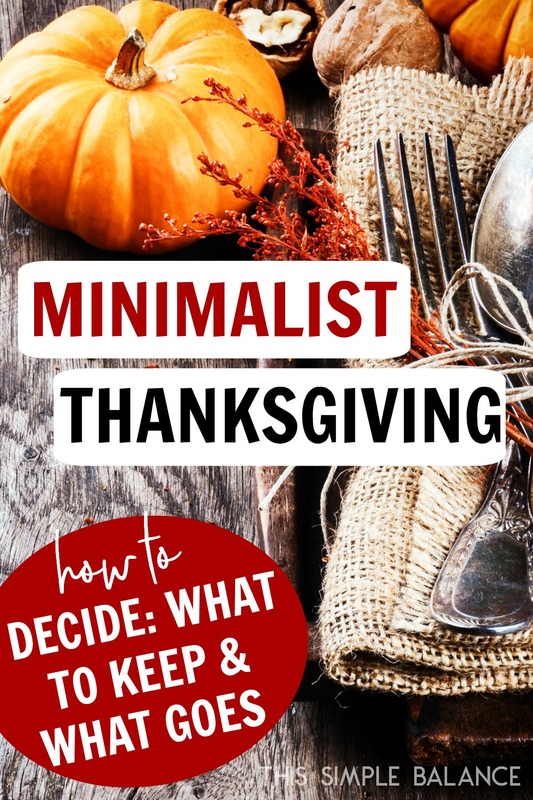 Did you celebrate a minimalist Thanksgiving this year? Whether you had a simple or elaborate Thanksgiving, share your Thanksgiving highlight in the comments! Help a friend out: share this! Excellent article! Everyone gets so occupied and worried about all that’s going on this time of year. It’s rewarding to step back and relax with some of the minimalist ideas you’ve presented. The information provided on thissimplebalance.com is intended for educational purposes only and is not intended to treat, diagnose, or prevent any disease. The information on this website is not intended to replace a one-on-one relationship with a qualified health care professional and is not intended as medical advice. It is intended as a sharing of my knowledge and my own personal experience. I encourage you to make your own health care decisions based upon your own research and in partnership with a qualified health care professional.